Ok, I said I saw two limited edition flavors at Walmart. Well, as you can tell from the title of this post, the one that won me over was Ben & Jerry's American Apple Pie Ice Cream. Now before we go too far, let's go down memory lane for a second. 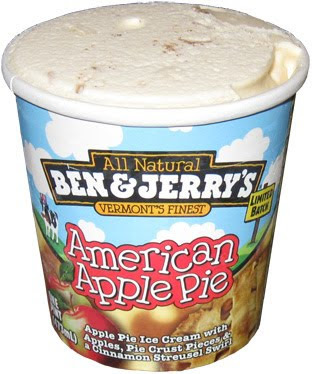 I did a little research and I discovered that American Apple Pie was once known as just "American Pie". It was a limited edition flavor launched in 2006, and it had a mission, in fact, it had a website (if you've never used archive.org, you can see it's pretty cool). So, a quick site synopsis shows that Ben & Jerry were pointing out that a reasonable cut in nuclear spending would be much better spent on taking care of our nation's children. The site was last seen in April 2008 and the flavor may have been on hiatus last year. Well, the message may be gone, but the flavor is back. 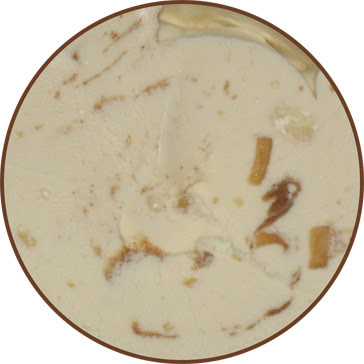 This is the "new" American Apple Pie: "Apple Pie Ice Cream with Apples, Pie Crust Pieces & a Cinnamon Streusel Swirl." I will admit that calling it just "American Pie" might have thrown people off in the past. I mean, you'd probably still lean towards the freezer cabinet and read the actual description, but I was sold as soon as I saw the words apple pie, I didn't really need anything else. Let's take a closer look here. Those rectangular bits you see are the thinly sliced apple chunks. This is actually a very slick idea because it winds up adding a bit of apple flavor without actually having to bite or chew the bit with unnecessary effort. That big dark brown bit on the left (kinda looks like a horse's head maybe), well, that is a bit of cinnamon swirl. That funny white-ish / reflective / oval-ly spot in the northeast corner there is a bit of pie crust piece. Every pie bit I found was approximately this size. So, are you excited yet? I was. My only other apple experience is with the chewiness known as Edy's Apple Pie and I was curious how a premium ice cream company would tackle this seasonal flavor. Overall, I like it. It's not the greatest thing since sliced bread, and I would definitely appreciate more pie bits, but my first impression was still pretty good, if not a bit ho-hum. I went back in the second scoop the next day and I got lucky. I hit a spot that was swirl on top, pie bits, and more swirl on the bottom. Oh yeah. now this is what I was imagining when I cracked open the pint the day before. I can't say it enough: I'm a sucker for pie bits and this spot I hit was the perfect combo of all the ingredients. Now if only every bite was like that. The base and apple bits are quality, but they just don't excite me. I wish the whole pint was an overload of the excellent cinnamon swirl and the pie bits. Actually, now that I think about it, I'd rather just eat an awesome pint of B&J's Cinnamon Bun. Note: The U.K. Had "Oh My Apple Pie" which was a similar flavor without the swirl. It was renamed to "Apple-y Ever After" in 2012 before being cancelled sometime before the 2015 season. I preferred it better when they sold it in the scoop shops at 'Appley Ever After.' I too would rather go for Cinnamon Bun. It sure sounds like it tastes better! Love this ice cream, the best I have ever had!